Russian President Vladimir Putin recently told a 9-year old child that Russia's border doesn't end anywhere. Considered one of the most powerful leaders of the world, Russian President Vladimir Putin while interacting with a child at an awards ceremony for geography students, asked one of the kids on stage "Where does the Russian border end?" The boy, who appears to exactly know the answer confidently says, "at the Bering Strait" following which Putin holds him close and tells the little kid "Russia's border doesn't end anywhere". 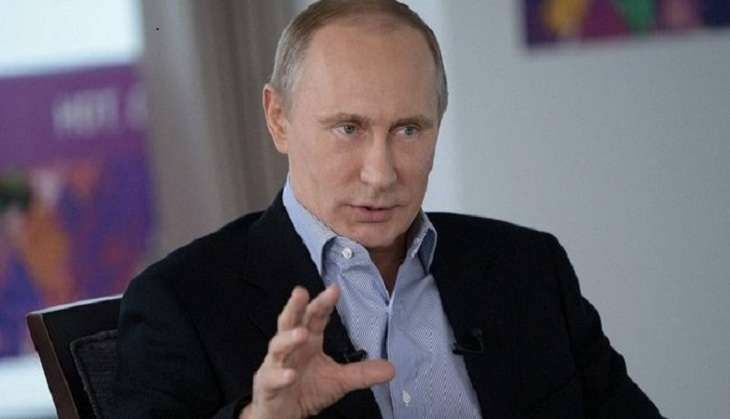 According to BBC, Vladmir Putin, in July 2014 had pledged to defend ethnic Russians wherever they live. Three months after Russian troops annexed Ukraine's Crimea peninsula, he spelled out his doctrine to Russian ambassadors, according to the report which quotes him pledging, "I would like to make it clear to all: our country will continue to actively defend the rights of Russians, our compatriots abroad, using the entire range of available means - from political and economic to operations under international humanitarian law and the right of self-defence." Just before his comment about Russia's border, President Putin asked five-year-old Timofey Tsoi to name the country whose capital is Ouagadougou, to which the kid correctly answered "Burkina Faso", but he struggled after being asked about the country's old name. Putin, while helping out the kid he said, "Upper Volta! Good lad!" Before the disintegration, Soviet Union used to be referred to as "Upper Vola with rockets", he was quoted saying. The award ceremony was organised by the Russian Geographical Society.